Eurozone Slides Back Into Recession. Both manufacturing output and service sector activity contracted in March, showing the worst performances for three and four months respectively. However, in both cases, the rates of decline were only very modest. Output rose in Germany, but the rate of growth slowed to a three-month low to show only a marginal gain. Output meanwhile fell slightly in France for the first time in four months, and dropped sharply again in the rest of the region. 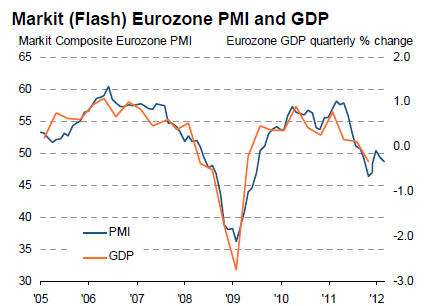 Flash Eurozone PMI Composite Output Index at 48.7 (49.3 in February). 3-month low. Flash Eurozone Services PMI Activity Index at 48.7 (48.8 in February). 4-month low. Flash Eurozone Manufacturing PMI at 47.7 (49.0 in February). 3-month low. Companies cut employment levels for the third month in a row, contrasting with rising headcounts over the prior 20 months. The rate of job losses was only very modest, but nevertheless the highest for two years. Employment barely rose in Germany, contrasting with the strong growth seen throughout last year and showing the weakest increase for two years. “The Eurozone economy contracted at a faster rate in March, suggesting that the region has fallen back into recession, with output now having fallen in both the final quarter of last year and the first quarter of 2012. The downturn is only very mild at the moment, with the PMI signalling a drop in GDP of approximately 0.1-0.2%, and an upturn in business confidence in the service sector provides hope that conditions may improve again later in the year. However, firms are clearly focusing on cost reduction, with employment falling at the fastest rate for two years as inflows of new business continued to deteriorate, reflecting weak demand across the region. “Even hiring in Germany has almost ground to a halt due to a further drop in new business, suggesting that the brief improvement in business conditions seen at the start of the year is running out of steam. French companies meanwhile reported a drop in activity for the first time in four months, and the first cut in staffing levels since last September. Germany and France look to have avoided a return to recession, but only by very narrow margins. Let’s now turn our focus on the vaunted German export machine. 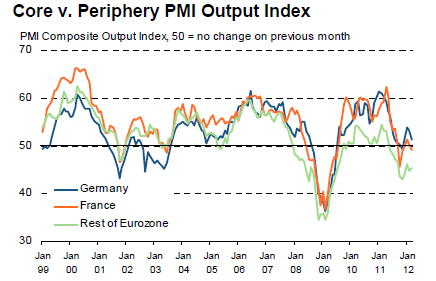 Please consider the Markit Flash Germany PMI®. Flash Germany Composite Output Index at 51.4 (53.2 in February), 3-month low. Flash Germany Services Activity Index at 51.8 (52.8 in February), 4-month low. Flash Germany Manufacturing Output Index at 50.5 (53.9 in February), 3-month low. At 51.4 in March, down from 53.2 in February, the seasonally adjusted Markit Flash Germany Composite Output Index indicated only a marginal expansion of private sector business activity. Output growth has now been recorded for four months in a row, but the latest rise was the weakest since December 2011 and slower than the long-run survey average. March data pointed to a slight reduction in new business received by private sector companies in Germany. This renewed contraction in client demand means that total new work has now fallen in seven of the past eight months. The overall reduction was driven by a solid drop in manufacturing new orders, whereas service providers noted a modest expansion in March. Manufacturers also reported a sharp and accelerated decline in new export business, suggesting that softer global trade flows had been a key factor behind the latest fall in new work. Highlighting a corresponding weakening of worldwide demand for raw materials, manufacturers pointed to the strongest improvement in suppliers’ delivery times since July 2009. Input price inflation meanwhile accelerated for the fifth month running in March, reaching its highest since June 2011. Anecdotal evidence widely cited higher costs for fuel and raw materials. Strong competition for new work meant that firms were generally unable to pass on the full extent of these price rises to clients in March. Renewed contraction in client demand means that total new work has now fallen in seven of the past eight months. Strong competition for new work meant that firms were generally unable to pass on the full extent of these price rises to clients in March. What’s with the Markit “Pollyanna” Forecasts? “A retreat back below the 50.0 no-change level for the Eurozone PMI is a disappointment, and highlights the ongoing risk that the region may be sliding back into recession. Although business conditions are showing signs of stabilising so far this year, which represents a marked improvement on the widespread deepening gloom seen late last year, the Eurozone is by no means out of the woods. Demand needs to improve considerably in coming months before we can safely say that the region will return to anything like reasonable growth. My response in Eurozone PMI “Worse Than Expected” and Back in Contraction; Expect German-Periphery Divergence to Resolve to the Downside for Germany was as follows. The idea that Europe can avoid a recession is complete silliness. Europe is clearly in a recession already. The amazing thing is things have not deteriorated more than they have. Unlike the Chief Economist at Markit, I expect the divergence to resolve to the downside for Germany, not for the divergence to continue for some time. Given conditions in Europe and Asia, the odds that Germany is immune from the global slowdown are essentially zero. Look for outright contraction next month in Germany and for economists everywhere to finally throw in the towel on the half-baked notion that Germany can avoid a recess in austerity-driven Europe with China slowing as well. The same holds true for the US. The irony in the US is economists who expected Asia to avoid a US recession in 2008, now believe the US can avoid a slowdown in the rest of the world. Decoupling theories are as silly now as they were then.